Traders are all about making money, pure and simple. The Guild rules the transportation business with an iron fist, and through contract work and playing the commodities markets, a Trader earns (or loses) his fortune. Perhaps the most (in)famous figure among Traders was Arnile Hanskwin, Syndic of the Trader's Guild. He was known for his desire to come up with more and more devious ways to combat the efforts of those who would steal from a trader. He was especially inventive when it came to designing new trap varieties. Inside Riverhaven's large guild hall, the noble Guild Leader Willowbrook instructs her students in commerce and finance. The shrewd Guild Leader Raelem administrates guild business from her office in opulent Brickwell Tower. The capable Guild Leader Seranda oversees sea trade at the Surlaenis exchange. The vital skills for a Trader are Lore skills, particularly Trading and Appraisal. Weapon skills are not required, but some competence in Armor and Survival skills must be attained. Traders can rent pack animals or caravans to transport goods between guild outposts. These can also be used to help drag the corpses of fallen adventurers more effectively. Only Traders have access to the commodities market, allowing them to speculate on price fluctuations between cities and provinces. 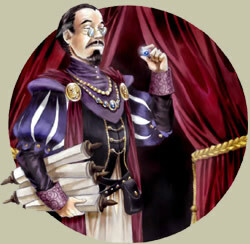 Traders receive a better price when selling gems, and may sell in bulk for extra convenience. Only Traders may set up shop in an auction hall or market, allowing for convenient sales to other adventurers.